That’s not the sad part, though. The sad part is the way the market backlash and prohibitions against wildness in women painters now seem to shadow what she’s actually doing. I love Schutz’s work. 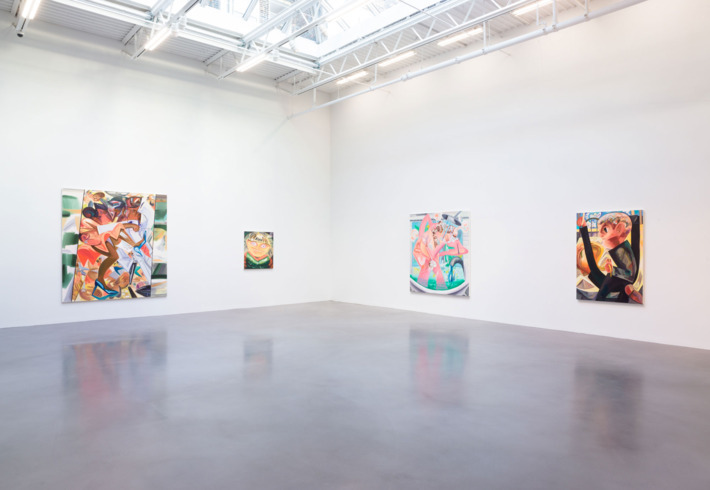 Yet in her current exhibition — her first since 2013, it is at Petzel gallery — she seems overly self-conscious, tighter, caught between urges, alternately cartoonish and figurative but also more abstract and all-over. Few artists her age are as fearless when it comes to color; here, a profusion of citrus colors, Creamsicle orange, Lik-M-Ade yellows, violet, pear shades of green. 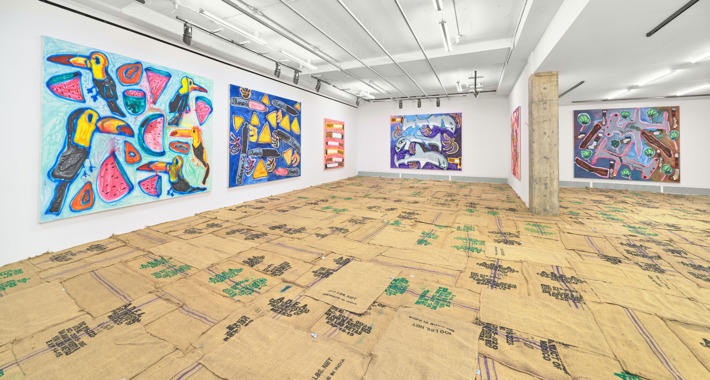 Her shattered, multicolored, disjunctive compositional fields are rivaled only by elders like Peter Saul, Elizabeth Murray, David Salle, Jörg Immendorf, and James Rosenquist. She can seemingly master any space and scale. In the mural-size Shaking Out the Bed, figures, seen perhaps from the side, maybe lying down, reaching to the painting’s right side to the dials there to adjust perspectival vantage point, appear from above, slip into different pictorial spaces, or try to get outside the frame. It’s a kind of history painting unmoored and with no history. 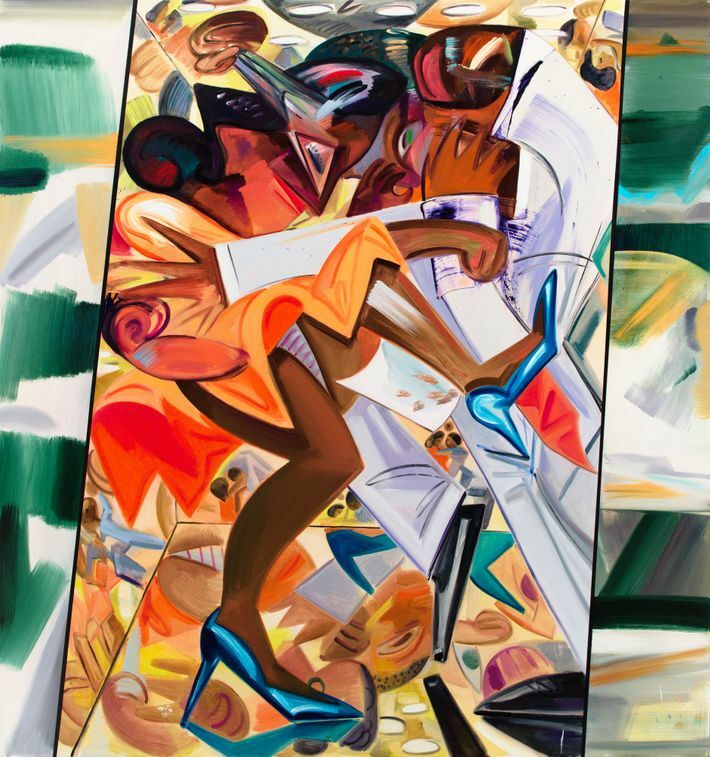 In two of the best works here — Fight in an Elevator, which looks part Harlem Renaissance and part Who Framed Roger Rabbit, and the square-looking but not-square Slow Motion Shower — Schutz forces two of painting’s major formal subplots to the fore. The first is how everything in any painting is always pressured, held in, defined, or in dialogue with the edges of frame. See the shower as an allegory of painting. A figure, let’s say an artist, is held in and turning within the borders of the shower curtain — a.k.a. the canvas. The figure is also bathing in liquidity — a perfect metaphor for paint — naked, in pleasure, but also abjectly covered in smudges, swiveling, scrubbing, identity blurred. Everything outside the tub, however, is black and white; maybe that way, for painters, reality becomes less real than the one they’re trying to render. 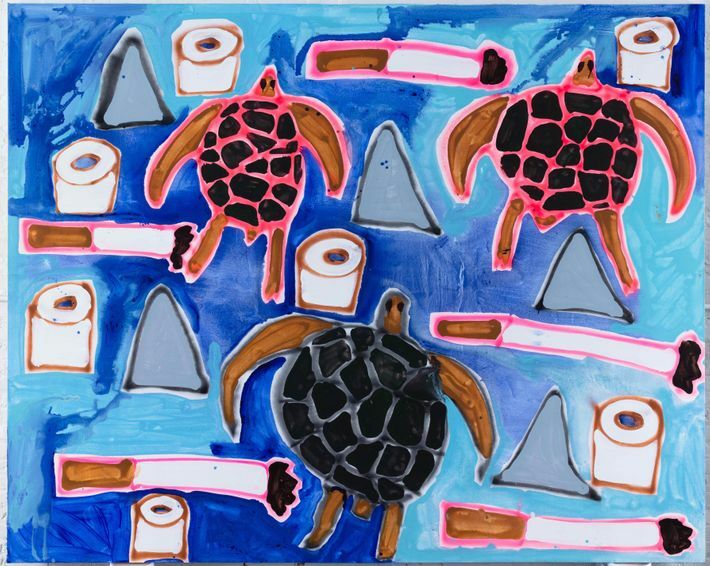 *This post has been corrected to show that Josh Smith’s paintings are priced up to $67,000, not $80,000.